Vanna K Blog: An Heirloom Classic from Vanna K! An Heirloom Classic from Vanna K! This gorgeous diamond engagement ring is a new addition to Vanna K's Hand-Engraved Collection. With the band's uniquely curved design, this hand-crafted ring immediately reminds you of an antique keepsake. Expert artisans combine the elegance of hand-crafted metal with 1/4 Carats of micro-paved diamonds to create a true beauty. The 1 carat round center tops off this instant classic. This is a ring you can not only be proud of for the rest of your life, but can proudly pass on to future generations! 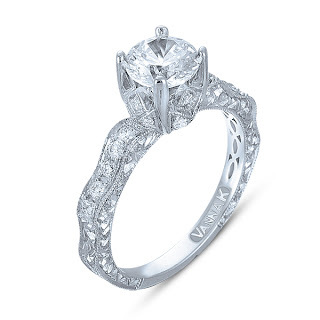 Find this and other uniquely hand-crafted engagement rings today at Vanna K.